Paperback, with flaps, 224 pages, 13.5 x 21.5 cm, 5.3 x 8.5 in. 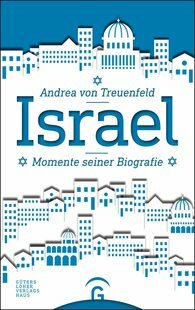 Israel is a country with which, because of its history, Germany is inviolably linked and which time and again polarises. This book tells its political and personal history in concise, informative episodes. For each of the seventy "years of its life" of this complicated state, the book focuses both on central and formative events and people and on unusual and less-known individuals and happenings. This is a comprehensive reading book which is as surprising, amazing and fascinating as the country itself.